Originally uploaded by The Stitchin Sheep. Don't my feet look so happy in their new socks? They're are so lovely (the socks, not the feet), aren't they?. Amanda made them for me. It's a sock I've seen on other blogs before. 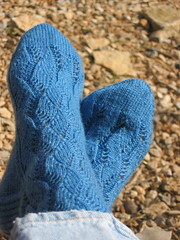 Comes from an Interweave Knits issue I don't have, so I'm so excited to have a pair now. They're comfy, too. You can tell by how relaxed my feet look compared to the before shot. It's not really warm enough to warrant wearing them in my shoes yet. But, it does get pretty chilly at night, and I do believe I've found a really good reason to break my husband's neurotic no-socks-in-bed rule (by the way, I think it's only fair to insist on a no-underwear-in-bed rule to go along with it). So, my feet will be toasty warm tonight! Thanks, Amanda.